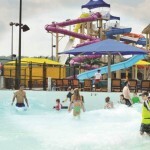 HomeCalendar of EventsNew Parrot Island Waterpark opening on Memorial Day weekend! 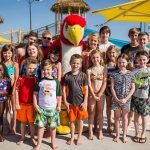 New Parrot Island Waterpark opening on Memorial Day weekend! 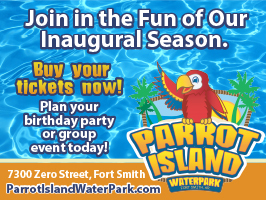 The new Parrot Island Waterpark in Fort Smith will officially open on Saturday, May 23rd, at 10 a.m. The new Parrot Island Outdoor Waterpark is located at Ben Geren Park. Miniature golf, go karts, playground equipment, outdoor picnic areas and pavilions, softball and soccer fields, tennis courts, a 1 ½ mile fitness and circuit walking trail, two 18-hole disk golf courses, over eight miles of paved bike trails, 11 miles of mountain bike trails, and an outstanding 27-hole county golf course. Do you have any season pass discounts opportunities right now, before the waterpark opens? We sure do! Family Season Passes are available at a 10% discount for the first 100 sold and is a great value. Season Pass holders can enjoy the waterpark all summer long, from opening day Memorial Day weekend until Labor Day weekend. Tell us about all the attractions. Will you have a lazy river (we love those!)? What about water slides? 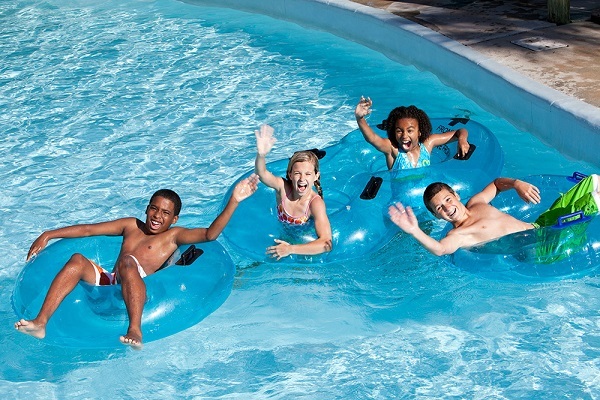 We have it all, lazy river, activity pools, slides … and the area’s only wave pool! Caribbean Splash Wave Pool-Jump. Play and swim among “tidal” waves in 85,000 gallons of water in the region’s only wave pool for endless fun! Crocodile Creek Lazy River. Enjoy hours of carefree fun floating down our 500 foot lazy river with a tropical waterfall and surprises along the way! Toucan’s Cove Activity Pool. 250,000 gallons of aquatic fun connected to Crocodile Creek! Lily pads, basketball courts, and so much more provide for aquatic fun! Tiny Turtle Island Pool and Splash Area. Short in depth but long on fun. Tiny tots can climb, splash, slide and play to their heart’s content in our dedicated children’s area. • Pelican Plunge-Our most extreme slide twists & turns for over 265 feet, including “translucent” bands along the way! • Tangerine Twist- From 35 feet off the ground you will flow almost 200 feet on a twisting track to the plunge pool below! • Blue Macaw – Our open top slide is a gentle glide along a 200 foot path from 30 feet in the air to the plunge pool below! • Pineapple Plunge-40 foot high Speed Plunge Slide drops you at a 45 degree angle 135 feet to the gentle run out below! • Double the Fun – Our double slide offers side –by –side sliding fun! • Red & Twisted – Our red slide offers gentle twists & turns for the little ones! • Gentle Green – Straight and short, but long on fun! • Cool Blue – Our tallest slide for the little ones with a curved glide to the water below! Are there separate areas for little and big kids? You bet! 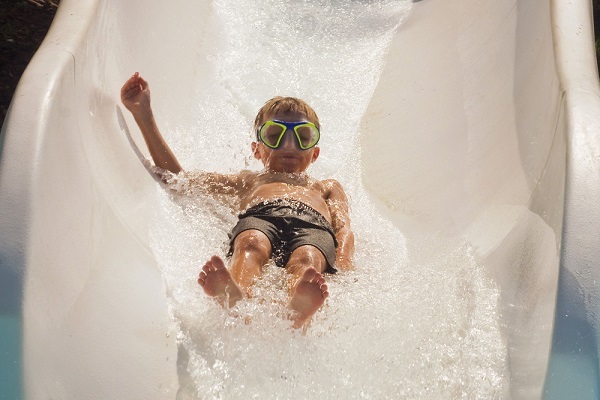 Big kids will love the thrilling slides and Toucan’s Cove with water activities galore. The little ones are going to love Tiny Turtle Island … it is so cute and has really fun tot sized slides and play features. Everyone is going to love the wave pool and lazy river! Big! We have over 370,000 gallons of water fun for all ages. Plus we’ve got lots and lots of free deck and lounge chairs, great grass lawns for playing and lounging, tables & umbrellas for snacking, both single and double water tubes, and we’ve also got great showers and lockers, a really fun Tiki Hut gift shop, and cabanas available for rent. Can visitors have birthday parties there? Parrot Island Waterpark is Summer Birthday Party Central! Best of all, we do all the work so mom doesn’t have to worry about setting up, cleaning up, getting the food, or guaranteeing a party that will be the talk of the neighborhood! · Birthday Honoree FREE with a Special Surprise from us! Of course! Our Island Breeze Snack Shop makes it so easy to have a snack or a meal and we have all the kid favorites like pizza, hot dogs, burgers and chicken fingers … and salads for mom! Plus we have ice cream and frozen treats, slushies, and everyone’s favorite soft drinks. Do you have any special events coming up at the park? We have great packages, which will change throughout the season. We really love our Family Night package! Tuesday and Wednesday nights are extra special for families at Parrot Island Waterpark when the whole family can enjoy the waterpark from 3 p.m. until closing. $49 for a family of four includes admission to Parrot Island Waterpark, Large Pizza with one topping, and Four Fountain Soft Drinks. Worth up to $78 makes this a great value. Additional children’s tickets are available for $5 per child. 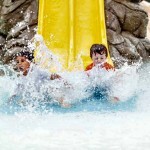 For more information about Parrot Island Waterpark, click here to visit their website. If you want to like them on Facebook to stay on top of what’s up in real time, click here! Tick Tock! Soak in summer before it’s gone. 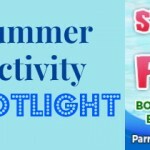 Summer Kickoff Giveaway: Win a family pack to Parrot Island Waterpark! Gardening: How to grow edible flowers!